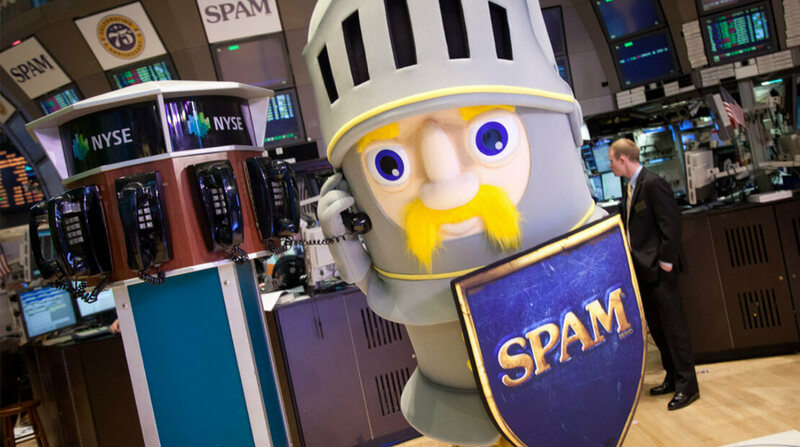 Jeffrey M. Ettinger, chairman of the board, president and chief executive officer at Hormel Foods, will be ringing The Closing Bell at the New York Stock Exchange (NYSE) today to commemorate the 75th anniversary of the SPAM®Family of Products. Ettinger will be joined by executives and guests of Hormel Foods as well as the company’s first spokescharacter, Sir Can-A-Lot™. Since the iconic luncheon meat was first introduced in 1937, more than 7 billion cans have been produced around the world, where it is known as the SPAM® brand no matter the language. Today, the majority of SPAM® luncheon meat is produced at the company’s Austin (Minn.) Plant, where ovens run non-stop, 24 hours a day, seven days a week, to accommodate global demand. Sir Can-A-Lot™, the spokescharacter joining the executives for the bell ringing, was introduced earlier this year as an embodiment of the SPAM® brand and has been appearing in television and online ads while also serving as the guide for the redesigned SPAM.com. In addition to the 75th anniversary of the SPAM® brand in 2012, next year, the company will celebrate the 50th anniversary of Hormel®Cure 81® hams. Today, these brands continue to grow and attract new fans while delivering consistent quality products and category innovations. For photos and video of the bell ringing, connect with Hormel Foods on Twitter (@HormelFoodsCorp, @SPAMbrand,) and NYSE Euronext on Facebook (NYSE Euronext-Official Site), Twitter (@NYSE_Euronext) and YouTube (nysetv1). Follow tweets at hashtag #NYSEBell. Photos available via Associated Press/New York (212.621.1902), Reuters America (646.223.6285) and Bloomberg Photo (212.617.3420). The Closing Bell (starting at 3:55 p.m.) feed is available via Ascent loop #4009. Media seeking footage via The Switch should contact NYSE Broadcast at 212.656.5483. Hormel Foods to Present at InvestMNt Hormel Foods that Jeffrey M. Ettinger, CEO, will present at the 2012 InvestMNt conference. Hormel Foods Corporation, based in Austin, Minn., is a multinational manufacturer and marketer of consumer-branded food and meat products, many of which are among the best known and trusted in the food industry. The company leverages its extensive expertise, innovation and high competencies in pork and turkey processing and marketing to bring branded, value-added products to the global marketplace. The company is a member of the Standard & Poor’s 500 Index, Dow Jones Sustainability Indexes, Maplecroft Climate Innovation Indexes, Global 1000 Sustainable Performance Leaders and was again named one of “The 100 Best Corporate Citizens” by Corporate Responsibility Magazine for the fourth year in a row. The company enjoys a strong reputation among consumers, retail grocers, foodservice and industrial customers for products highly regarded for quality, taste, nutrition, convenience and value. For more information, visit https://www.hormelfoods.com.